The perfect grilling companion, the Stainless Steel 12-inch Wok by Napoleon is custom fit for the PRO825 Gas Grills Power Burner, but can be used easily on any grill, gas, electric and ceramic stove. This stainless steel Wok has a satin finish interior like the professional woks do to prevent food from sticking. 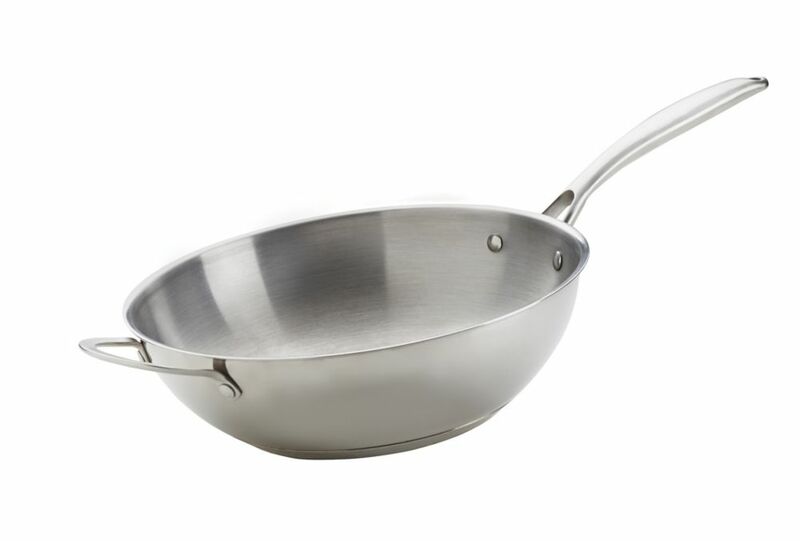 The Napoleon Stainless Steel 12-inch Wok features two handles, a large ergonomic handle to manipulate the wok and easily toss your stir fry, and the smaller handle to provide stability when moving large and heavy portions. The flat bottom construction means that this wok can go from grill or stove to table without fear of tipping. Create some culinary masterpieces, hearty stews, delicious soups and stir-fry with the Napoleon Stainless Steel 12-inch Wok. For exotic cuisines or home spun favourites, the Lodge Cast Iron mini wok retains heat well, making short work of any dish. Since 1896, the Lodge family has been casting premium iron cookware at our Tennessee foundry. As the sole American manufacturer of cast iron cookware, we are proud to carry on the legacy started by our great grandfather Joseph Lodge. We don't just make products; we make heirlooms that bring people together for generations. Stainless Steel BBQ Wok The perfect grilling companion, the Stainless Steel 12-inch Wok by Napoleon is custom fit for the PRO825 Gas Grills Power Burner, but can be used easily on any grill, gas, electric and ceramic stove. This stainless steel Wok has a satin finish interior like the professional woks do to prevent food from sticking. The Napoleon Stainless Steel 12-inch Wok features two handles, a large ergonomic handle to manipulate the wok and easily toss your stir fry, and the smaller handle to provide stability when moving large and heavy portions. The flat bottom construction means that this wok can go from grill or stove to table without fear of tipping. Create some culinary masterpieces, hearty stews, delicious soups and stir-fry with the Napoleon Stainless Steel 12-inch Wok.